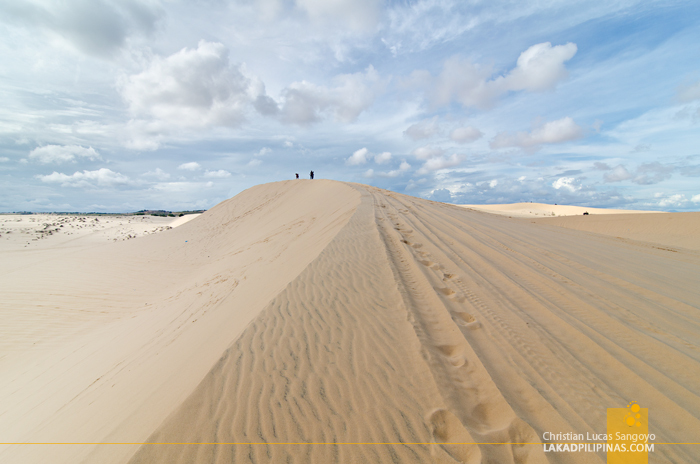 Without extra cash to spare for a quad bike, we trudged across the cream-colored dunes of Mui Ne on foot like Fremen looking for Melange. It was harder than expected, our feet sinking on the soft sand every step we took. A few meters of walking left us panting; and we planned on going all the way to the top of a huge dune, which might as well be a universe away. Still, the view was absolutely out of this world, I could not imagine a country like Vietnam having landscapes like these. Wanting to see the sights in town with the least bit of effort, we booked our Mui Ne half day tour on one of the many tour companies along the town’s main drag. We closed our deal at VND120,000.00 (USD5.25 | PHP270.00) for each of us. It was a group tour and we’d have a couple of companions along with us on an open jeep, but for the price and its inclusion, it was quite cheap! 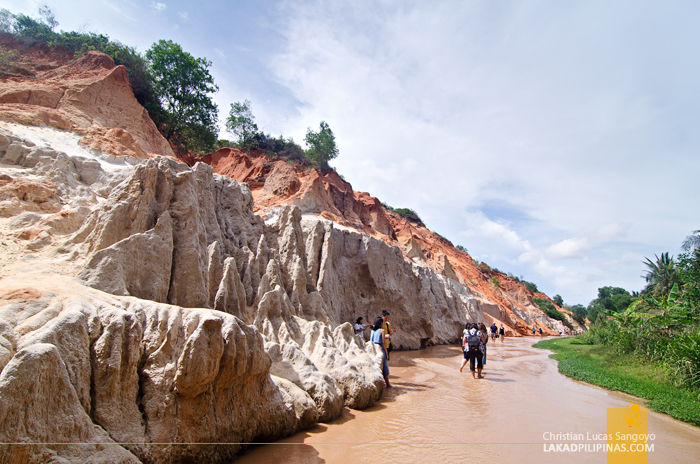 The no-frills tour includes a visit to four of Mui Ne’s top tourist attractions; the Fairy Stream, the fishing village, the White Sand Dunes, and finally, the Red Sand Dunes in time for sunset. It includes a pick-up from the hotel and a drop right after. Not that we really needed a pick up since Joe’s Seaside Boutique was just a hop away from their tour office, but we took their offer nonetheless; time enough to lounge and rest at the resort before the 2:00PM call time. 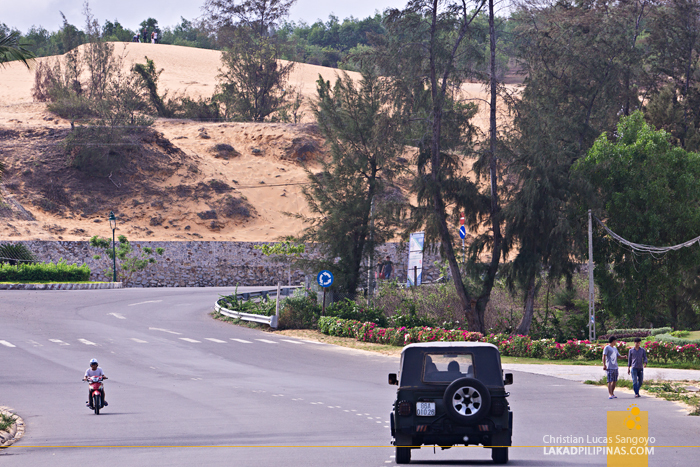 In hindsight, we actually could’ve done the tour by commuting using Mui Ne’s cheap public buses, but we would not be able to visit the White Sand Dunes—it was really far away from town. If only we have the guts to drive a motorbike in Vietnam, an idea which seemed more like a death wish than anything else. 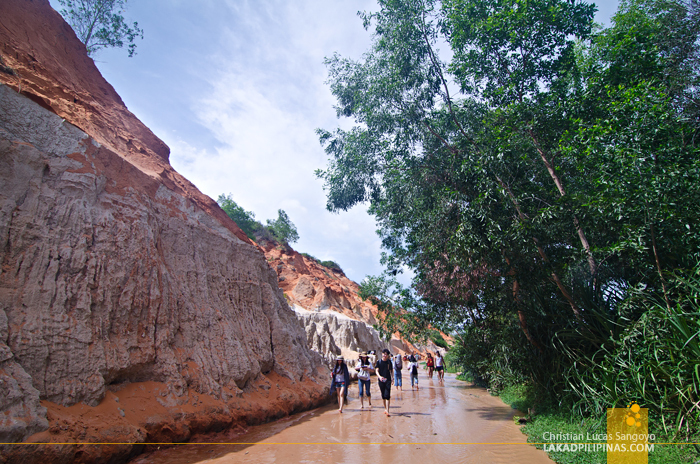 Our first stop was Mui Ne’s Fairy Stream. I have absolutely no idea about this magical stream until we arrived in town. We were on a jeep with another couple and it stopped right before a small bridge just a few kilometers away from where we’re staying. “Go down the bridge.” Our driver told us. It doesn’t really look like fairies live down there, with huge graffiti painted on the walls, but down we went. The water was about ankle deep with a firm light brown clay bottom. It was easy walking barefoot—the water looks quite clean—but it was kinda hard hefting two cameras and a pair of flip flops, so I left mine on. 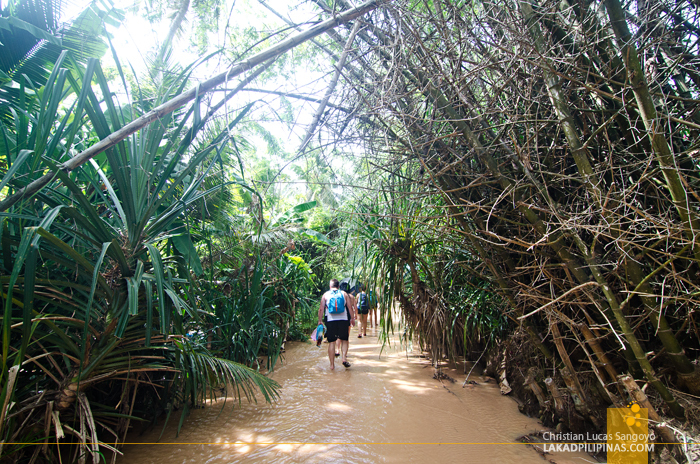 The path started narrowly, with thickets of bamboo and palm fronds on both side. A few locals sat along the bank, hawking drinks and trinkets—I really don’t think there are fairies here. Eventually the stream opened up, the greens transforming into rough walls of whites and reds; rock formations as strange as those on Mars. The crumbly limestone walls and red clay dunes soar to about four floors at least. It was unlike anything I have ever seen. A few tourists were gingerly climbing up, but since we were pressed for time—we were only give an hour to explore—we pressed on until the water rose to our knees. C told me to go ahead. I went on alone, taking my time with every step, lest a sudden drop presented itself, and eventually a surprise greeted me at the end of the stream. 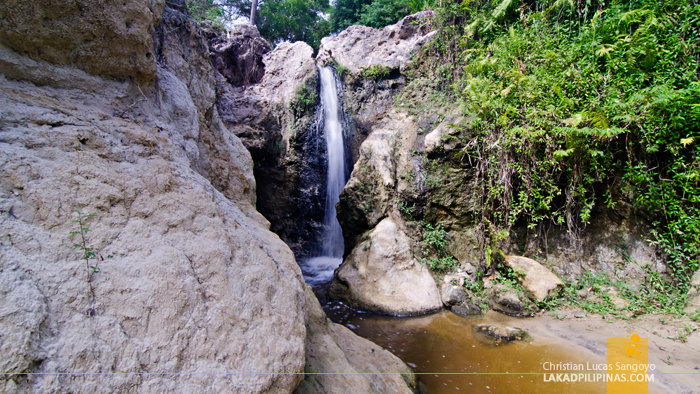 Hidden on a corner gurgled a small waterfall! There might be fairies living here after all. It took just a few minutes to drive to our next destination. 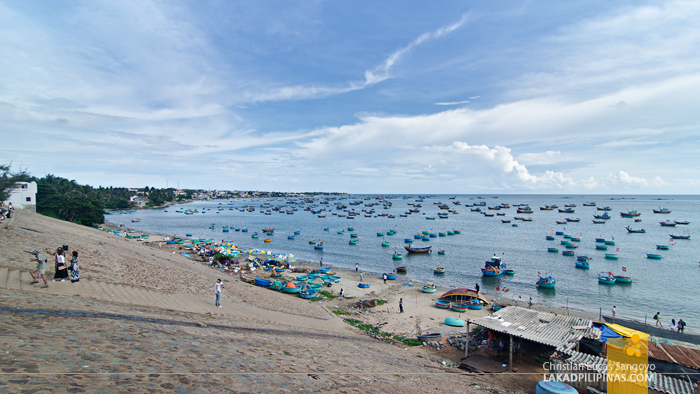 We alighted on an elevated road near a seafood restaurant overlooking the the Bay of Mui Ne. 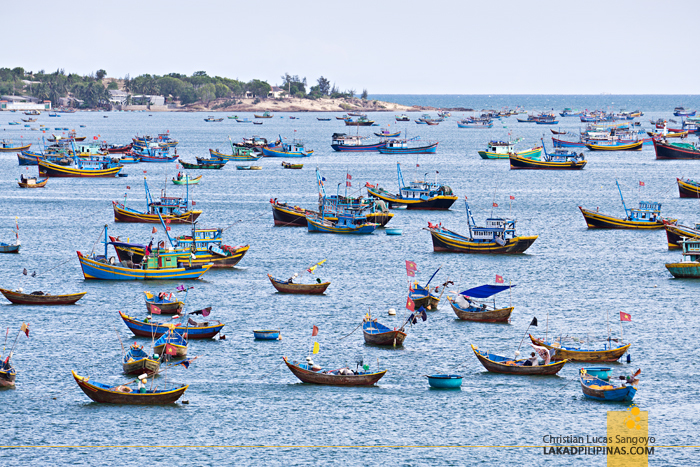 It was replete with colorful Vietnamese fishing vessels. On the background, houses and structures in lighter tones completed the scene. It reminded me somewhat of the Mediterranean, although I really haven’t been there, I imagined it would look something like this. A concrete stairway leads all the way down to the shore, but we were happy enough to see everything from up high. The best time to actually visit the village is during the early mornings, when the boats dock back here after a night of fishing. 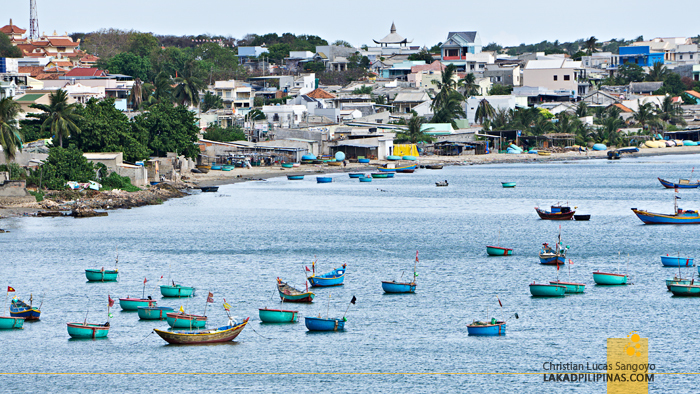 Their catch actually ends up on the many seafood restaurants they dub as bo ke, that run along the town’s coastal road. It’s the first time I’ve actually seen a circular water vessel. 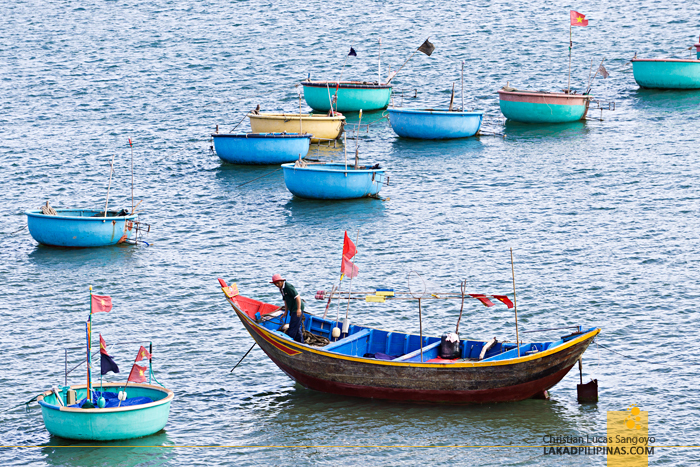 The Vietnamese call it thung chai, or basket boats. Most at the fishing village seem to be made from plastic or probably carbon fiber, but a few are indeed made from basket-weaved sheaved bamboos! These came about as an ingenious way of avoiding taxes imposed by the French for owning a boat during colonial times. Should have we walked along the shore towards its end, we would’ve chanced upon a beach strewn all over with multi-colored shells. It should’ve been one of the most unique beaches we’d ever see, but we’re on a time-constrained tour, so no dice. 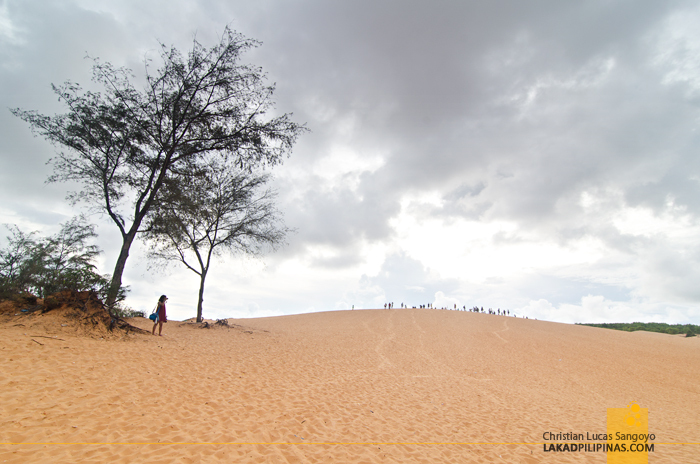 Mui Ne has two sand dunes up its sandy sleeves and we visited the larger and farther one first. It was quite a ways away from town and it took us more than half an hour from the fishing village to reach it. 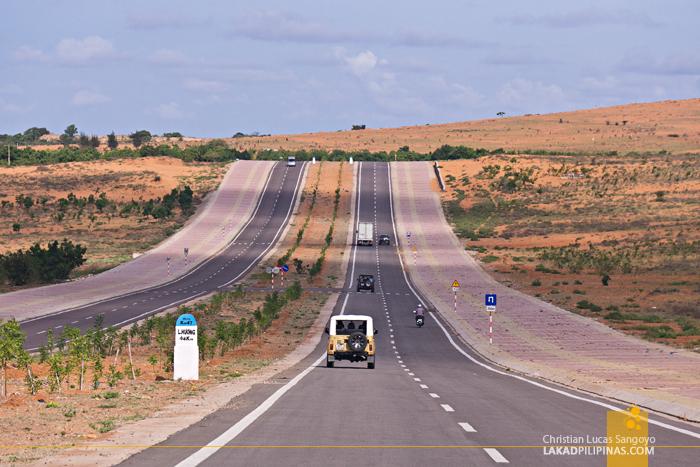 From the deserted highway, we can already see the huge dunes sloping gracefully across the horizon. Our jeep went inside one of the few camps along the dunes offering dune buggies and quad bike ATV’s for tourists. At a minimum of VND450,000 (USD20.00 | PHP1,010.00), the price is superlatively expensive. Even the Spanish couple we were with were hesitant to rent out one! 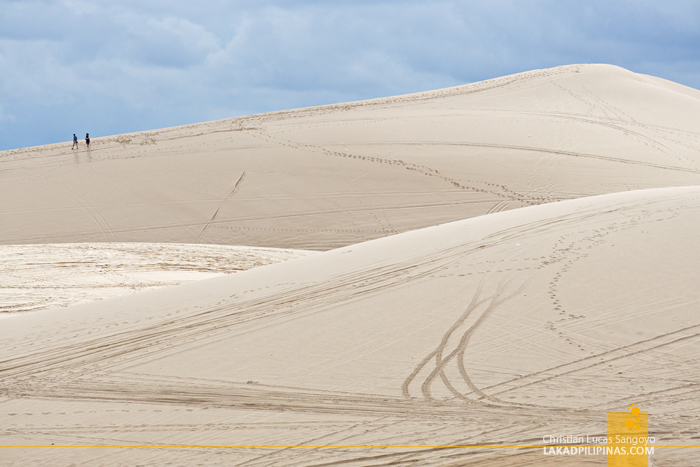 I imagine it would be really fun to zoom around the dunes, but we really have no choice but walk across it. Well, we thought it would be a lot more fun, but it turned out to be quite a challenge. The sand was very loose and shifts every time we put our foot down. Walking just a few meters left us quite exhausted. Good thing we brought water with us. 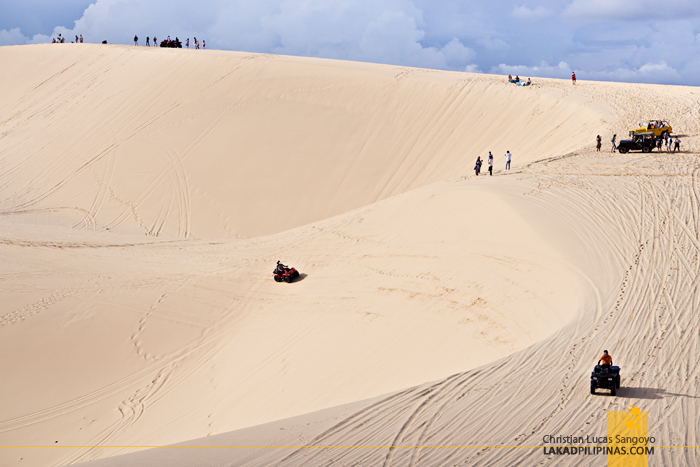 Eventually, after much stops, we reached one of the bigger dunes and climbed all the way to its top. It was absolutely breathtaking. 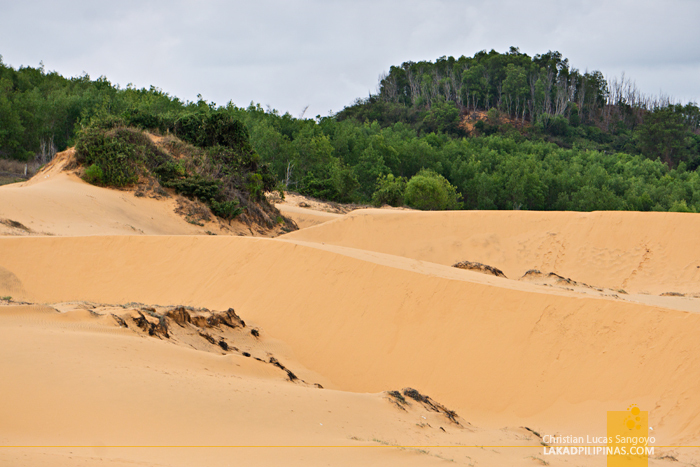 The only desert I’ve been to was at the Philippines’ Paoay Sand Dunes. 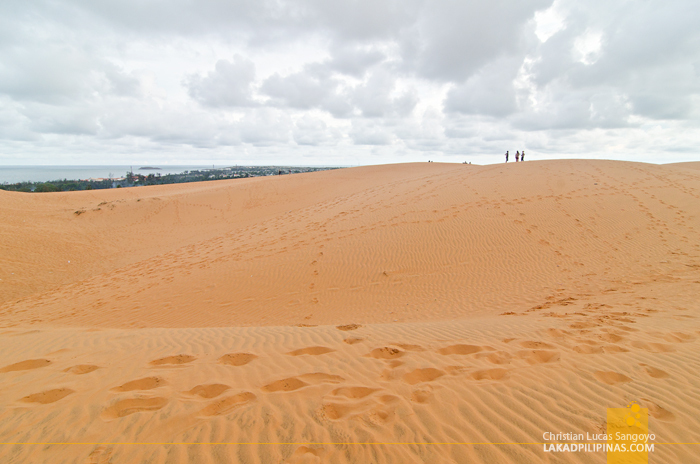 While it is beautiful in its own way, it doesn’t compare to Mui Ne’s White Sand Dunes; this one is more massive, a lot more majestic, and refined—well, as refined as deserts can be, lol. 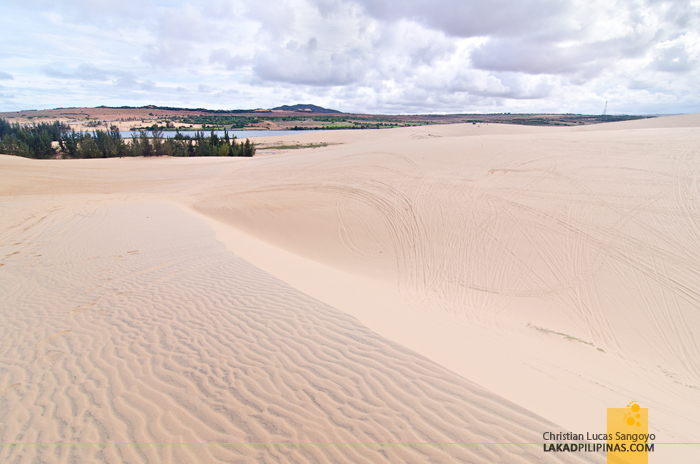 The dunes can get pretty hot, but we were lucky there were intermittent cloud cover during our visit. There were also a handful of tourists at the time, but with its expanse, they looked like ants to us. It seemed as if it was just us, plus a few ants riding motorized 4x4’s on the horizon. 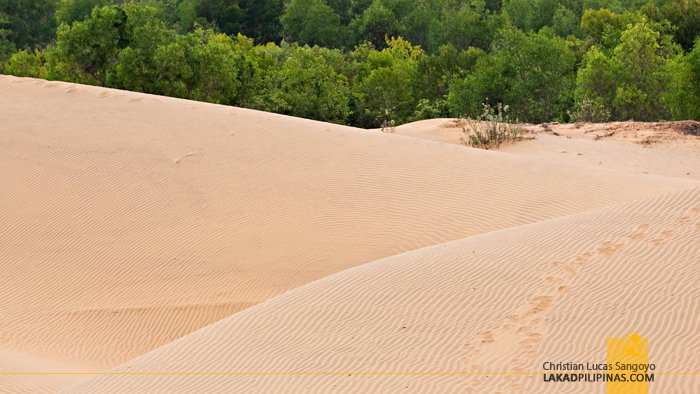 Going back to town, we dropped by the last spot on our list, Mui Ne’s famous Red Sand Dunes. 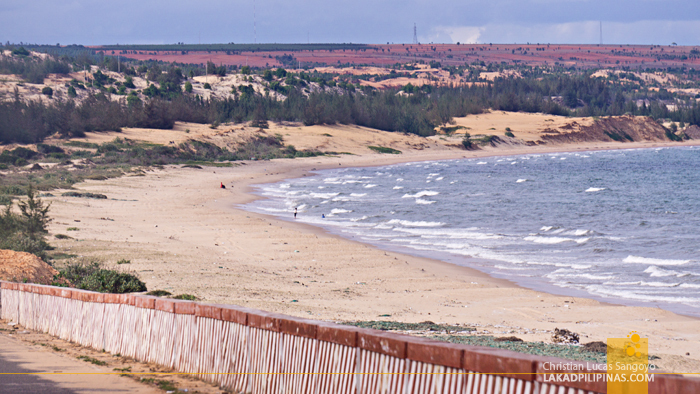 Most people go to Mui Ne all the way from Saigon not for its beaches but for these reddish brown dunes. 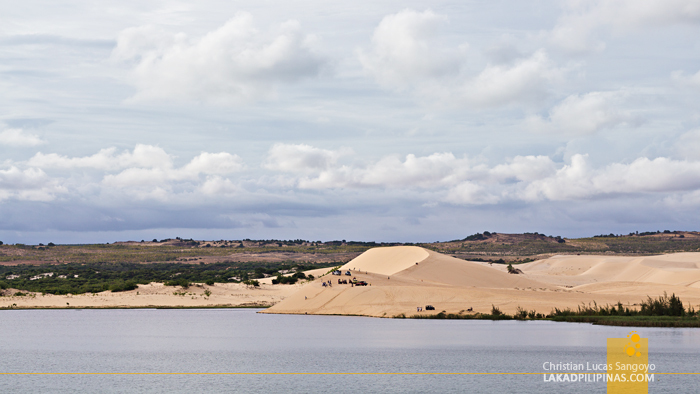 Being closer to town, it has a lot more tourists and feels more packed since it is smaller than the White Sand Dunes. We crested the first dune just as the sun was about to disappear from the horizon. Well, not that we and the hundreds of tourists lining up the dune can see it, cloud cover was pretty thick and it looked pregnant with rain. We stayed, even sans the glorious sunset, watching people slide down the dunes using makeshift sleds being rented out by local kids. The dunes near the road doesn’t have that signature ripples usually associated with desert sand since it’s well-trampled on by visitors, but the faraway ones still looks pristine. The only problem, really, is getting from point A to point B. It. Is. Extremely. Hard. To. Walk. On. These. Sand. Dunes. The heavens finally gave as we boarded our jeep for the last time; perfect timing for a perfect trip. Haha, if you don't have money for the dune buggies, that is. Which tour company did you go with ?